Whenever we go on a trip, the second thing (after my passport) I check to make sure I have in my travel bag is my noise isolating headphones. Constantly dealing with screaming kids, loud engine noise from airplanes, etc, sometimes I’m desperate to drown out the noisy bustle of people around me after a long day of travel and just enjoy some music. This makes a good set of noise isolating headphones an absolute must for frequent travelers. You already know that, though, or you wouldn’t be looking for the best noise isolating headphone right now,. Just tell me you wouldn’t like to be free of the noise and distraction around you while you’re on that brutal 13-hour flight. Now comes the daunting task of finding the best noise isolating headphones for 2018. There is always new technology that supersedes last year’s model, or completely blows the competition out of the water. I’ve put together a guide to what I believe are the top choices, to make it a little easier on you. I don’t know about you, but I love the ease of purchasing on Amazon, so the products in this table are Amazon products, to make it easy for you to click to read reviews or check out pricing for the various styles of headphones we’ve chosen as our top picks. In case you don’t have time to read all of the reviews we’ve listed below for each product, we’ve put together a quick-pick chart for you with our recommendations. Noise isolating vs cancelling? What’s the difference? First, you might be wondering what is the difference between noise isolating and noise cancelling headphones. Yes, there are distinctions between the two that might make your decision a little easier. What it really comes down to is whether you want to cut out all sound, or still allow for voices to be heard. I usually prefer noise isolating headphones because they are capable of drowning out all outside sound, up to a noise reduction rate of around 25 or 30 decibels (dB). They cut out the sound around you so you can hear your music, and only your music. A good pair should also keep the sound of your music contained within the ear, so others around you can’t hear it. On the contrary, noise cancelling headphones don’t drown out all outside noise. They aren’t meant to shut out the noise entirely, they’re meant to compartmentalize and reduce certain sound by the use of a miniature microphone that picks up ambient noise, and neutralizes it. I won’t go into all of the science behind this, because I doubt you really care, as long as it works! The pro of noise cancelling headphones when you travel is that the noise of the airplane engine, or the subway, or bus you’re riding in is dampened, but you can still hear things that are being said to you by your companion, or the flight attendant who wants to know what you’ll be drinking. This eliminates the need to pull the headphones off every time someone wants to speak to you. I wish it was as easy to find the best headphones for air travel as just deciding between cancelling and isolating. Unfortunately, there are a lot of other factors involved. Below is a list of the top considerations you should make when looking for the right pair. If you’ve ever had to remove a pair of headphones from your ears because they hurt, you know that size and fit really matter when finding the right headphones. You can’t really just buy any pair. You need to make sure they fit your head first. Look at how the manufacturer says they should fit, what size they come in, and if they are made specifically for men or women. All of these things will have an affect on the fit. Finding a comfortable pair is one of the hardest things because all ears are different and all headphones are made differently. Some people find that a particular kind of headphones work best for them, like over ear vs in ear. If you can at least narrow that down, you’ll have to try less pairs to find one that feels comfortable. Just remember that if one pair doesn’t feel so great, it’s worth it to try something different rather than suffering through it. There are a few pros and cons for having a wired or wireless headset. If you go with wired, you won’t have to worry about charging them so often, or running out of power when you’re using them. But wired can be bothersome for other reasons, such as the sound the wire makes as it brushes against your clothing (the sound can register in the headphones and be annoying). You’ll also want to think about how long or how short the cord is. Too long and it can snag on things as you walk. One of the top concerns with headphones is sound quality. A good pair of headphones will allow you to listen to your music at a normal volume, with a nice, smooth sound. Poor quality can make you turn them up too much for comfort. It can also be too brassy, or raspy and inevitably become annoying to listen to. There are three general types of headphones. These are closed back, open back and earbuds. The over-ear headphones encase your entire ear. There are some pros to this type, like shutting out more noise because they cover the whole area. but they can be sweaty and really large. If you don’t want to carry around a huge pair of headphones, this is probably not the right option. Open back might be better for travel, since it rests on top of your ear and doesn’t shut out all noise. However, if you don’t find the right fit, they can begin to irritate the sensitive skin on the ear and be painful to wear for long periods of time. Earbuds are the smallest option, saving tons of space over larger headsets. They’re easy to pack. They can form a good seal around the ear to isolate all noise. However, it’s very important to find the right fit so they don’t hurt your ears. Choosing a set of headphones for travel isn’t a whole lot different from choosing a pair for everyday use. We spend a lot of time commuting in the busy, noisy city, so cutting out the sounds around us each day is just as important as when traveling – and they are generally all the same noises. Loud buses, trains, airplanes, screaming babies… it’s all the same. 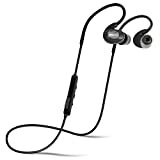 Below are short reviews of the best noise isolating headphones and earbuds that we’ve found. While each pair has its pros and cons, we didn’t list any here that we don’t like and wouldn’t recommend. What it really comes down to is personal preference – whether you want in ear, over ear, wireless, etc. Once made those decisions, you can confidently pick a pair from the lists below that suit your choice. This headset has a playback time of about 7 hours before a recharge is necessary, though we’ve found that they don’t usually hold a charge for quite that long. They have a built-in ceramic antenna that prevents dropped calls and issues pairing with bluetooth. The mic works well, and the noise isolation is strong enough to shut out most ambient noise around you so the music is crisper and easier to hear. 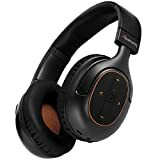 If you’re looking for a true noise cancelling, not noise supression, these are the headphones that will get the job done. These we consider to be the best noise cancelling earbuds. I like these headphones as a style upgrade to the typical sportier headphones. They are made with genuine wood and have a very appealing, sleep design. The headset is very easy to use. You can answer or end calls easily with a touch of a button. You can also easily skip tracks both manually and through voice control, which is also easily accessible on the headset. There is a built-in in-line microphone. Another thing we like about these headphones is the tangle-free nylon cord. It’s easier to wind and keep together than the typical plastic-covered cord. Keeping in mind that these headphones are not wireless, they have a nice crispy, powerful sound, with less static and interference than a wireless set. 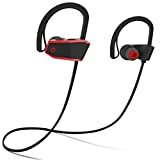 I’ve used the Sbode bluetooth headphones in a number of different settings. They work great for long airplane rides when you want to shut out the noise around you, and while sitting in the airport, or even at your desk at work. They don’t have a high level of noise cancelling. 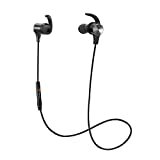 They use CVC 6.0 noise suppression technology, and that coupled with the tight-fitting earbuds will keep outside sounds to a minimum. They do have some very nice features, like being able to connect to two devices simultaneously. And they come with a small round, semi-hard-sized case so they don’t get damaged in your bag. I appreciate that they have an ergonomic silicon ear hook, so they stay firmly on your ear, even when you’re actively moving around, and they’re soft enough not to hurt the sensitive ear. You can play them up to 8 hours on a full charge, and should be able to charge them up again within 1.5 hours. The only issue we had was when we went outside with them. The sound quality dips a bit. Overall, this is a good pair of noise suppression headphones for the price. If you’re serious about shutting out the noise around you, these ISOtunes Pro headphones get the job done. They are ANSI-certified with a 27 dB noise reduction rating. That makes them one of the best on the market for shutting out noise. These headphones also have a 10-hour music playback and a 240-hour standby time. They’ll easily make it through a long international flight without needing a recharge. If you do happen to run of juice while on the road, it’s not a problem because they have a fast-charging USB-rechargeable battery. They pair easily with bluetooth and are wireless, so you don’t have to worry about tangled cords all the time. Even better, they’re extremely lightweight and compact, so packing them is easy. They’re also water and sweat resistant. These over-ear headphones are wireless and enabled with the latest 4.1 bluetooth technology. They have a built-in mic, volume and playback controls and a 30+ hours playback time. In case you’re planning to take them traveling, they comes with a hard-sided carry case that will keep them safe when not in use. These are easy to pair with multiple devices up to 30 ft away, and you can even plug a second headset into it so two people can listen to the music at once, which is a great feature for couples who travel together. They utilize CVC 6.0 digital noise reduction technology to filter ambient noise, but that doesn’t cut down on the pure, rich sound. There are a lot of choices for noise-isolating headphones out there, and that’s one of the major reasons why choosing the right pair is so difficult. Hopefully breaking out the possibilities like this will help you decide. If you don’t love the pair you settle on, you can always send them back and try another pair. There’s no reason to live with a pair of headphones that you don’t love. A good pair of headphones should be at the top of every traveler’s essentials list. With the help of the best noise canceling headphones for traveling, your next flight could be the adventure you’ve been waiting. I made this video to help you better understand the difference between Noise-Cancelling and Noise-Isolating Headphones. Here’s the link: https://youtu.be/UV3jkEI4HYo. Hope this might help you and the article list mention above also.